In light of Student Union winter elections on Thursday, this board encourages Brandeis students to participate actively and vote for figures who will represent us well in a government of our peers. 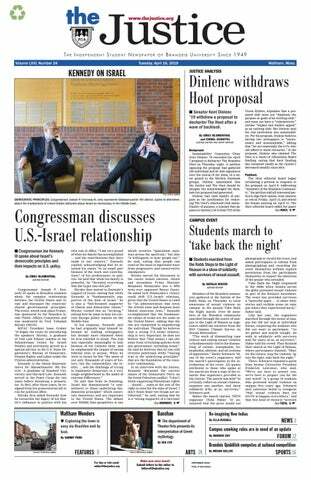 On Sunday, Jan. 29, the Brandeis community received an email from University President Ron Liebowitz, cosigned by eight other administrators, which directly addressed President Donald Trump’s executive order on immigration signed on Friday. On Jan. 18, the New York Times published a piece charting data demonstrating where students from different economic backgrounds attend college. On Saturday, Brandeis participated in the first year of Hult Prize@, a more local division of the larger Hult Prize competition. At the start of this semester, this board issued President Ronald Liebowitz a challenge. We called on him to avoid “the trope of the dispassionate establishment leader,” in an Aug. Since its founding, Brandeis’ identity has been shaped, in large part, by its Jewish roots and the sizeable Jewish presence on campus. This past weekend, the University reached a new athletic peak: placing two teams in the Final Four of the NCAA Tournament. The University used 10 percent less energy this fiscal year and reduced its carbon footprint by about eight percent from last year, according to new University data released in a Nov.
At Brandeis, protest plays a vital role in securing opportunities for many students. As a result, this board is concerned by the University’s recent lack of respect for this right.